When Europeans arrived in the New World, they did not only kill people with war, slavery and disease, they also attempted to destroy the cultures of the native peoples. Among so many cultural tragedies, one stands out in Mexico: the burning of ancient manuscripts illustrated and written before and shortly after the Spanish invaded. The Mexican codices, as they are called, are richly illustrated texts that provide a window into the life, history, religion, and culture of Mexico, before and after the Spanish invasion that began in 1521. Only about two dozen pre-Spanish codices survived the tragedy of the book-burning. Several others survive from after the invasion. The University of Arizona Library website says Mexican rulers also destroyed some manuscripts. The books were written and illustrated mostly by Mixtec, Aztec and Maya people and go back as far as 629 AD, through to 1642 AD. The Mixtec codices that survived are mostly pre-Spanish, while the Aztec manuscripts display influence of European culture. Only four Mayan codices survive, all pre-1521 AD. The Mexican codices are made of long strips of deer hide, cotton cloth or bark paper. Some of them have wooden covers. Pre-Spanish codices fold like accordions, showing images on both sides of the folio. If the manuscript was meant to displayed against a wall, the artists painted just one side. The largest group of early Mesoamerican codices are early Mixtec pictographic books from Oaxaca. “Some pre-Conquest Mixtec codices contain genealogical tables of their rulers from the birth of 4 Alligator, the first Lord of Tilantoga in the eighth century, to the last cacique in 1580. Births, marriages and deaths of their lords and rulers, as well as wars, conquests, religious ceremonies and feasts are the most important events represented in these genealogical and historical manuscripts. One does not find scenes from Mixtec everyday life; the focus is on the life and deeds of rulers,” says the University of Arizona Library. Mixtec codices include the Zouche-Nuttall, Vindobonensis, Bodley, Selden , Egerton, Columbinus, and Becker I . According to the University of Arizona Library, the Mixtec codices were not primarily intended as historical texts to pass on knowledge to subsequent generations, but rather were histories as mnemonic devices to help in oral recitation. Other codices of the central highlands of Mexico and the Mixtec Oaxaca region, called the Borgia group, are neither Mixtec nor Aztec and are about ritual beliefs in the 260-day ritual calendar. They include the Borgia, Laud, Cospi, and Fejérváry-Mayer codices. Just four Mayan books survived the book-burning by Franciscan missionaries. They are the Codex Dresdensis , the Codex Tro-Cortesianus (Madrid Codex), the Codex Peresianus (Paris Codex), and the Grolier Codex. “None of these remaining Mayan codices record any type of history or chronicles, they instead contain astronomy, divination, rituals and calendars,” says the University of Arizona website. All four of the Mayan codices possibly date to before the arrival of the Spanish, but the date of the Tro-Cortesianus has been questioned in recent years because European paper and writing are between two sheets of bark. 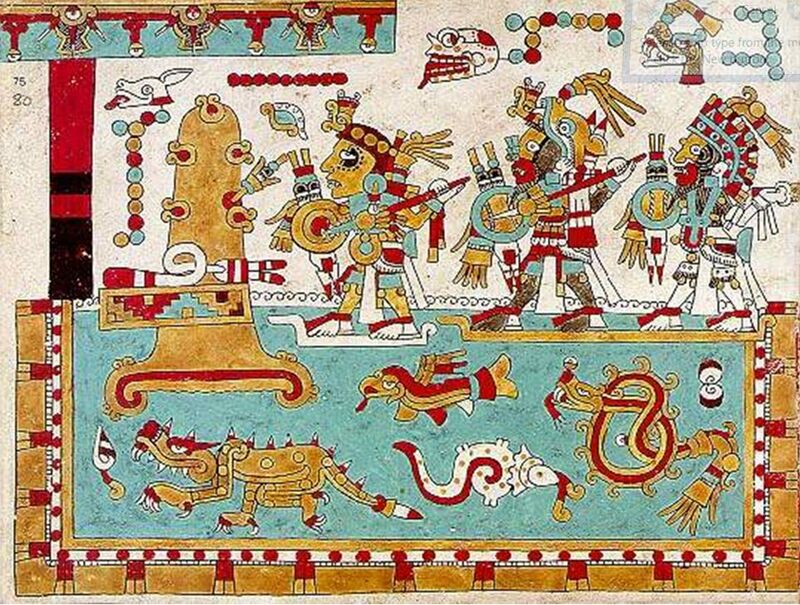 The World Digital Library says the Dresden Codex of the Maya people has figures, numerals and hieroglyphs of divination and ritual calendars, calculations of celestial bodies, instructions for new year ceremonies and descriptions of locations of the god of rain. Mexican codices from the colonial era include the Mendoza, Matrícula de Tributos , Borbonicus, Azcatitlan, Vaticanus A , and Xicotepec codices. Others that show even more Spanish influence include the Florentinus, Sierra, Tlatelolco, Historia Tolteca-Chichimeca, Ixtlilxochitl, Techialoyan García Granados, Tlaxcala, Magliabechianus, Azoyú 1, Tudela, and Totomixtlahuaca. For a few online pages of the codices in the University of Arizona collection, see http://www.library.arizona.edu/exhibits/mexcodex/intro.htm. The Foundation of the Advancement of Mesoamerican Studies Inc. website has a large collection of images of Mexican codices. The Mexican government also has a Spanish-language website with a large collection of codices at http://www.codices.inah.gob.mx/pc/index.php. The website http://www.mexicolore.co.uk/ has many stories and images from the codices. Featured image: In the Mixtec Zouche-Nuttall Codex, page 75, three warriors in battle-gear and on rafts approach a palace on a hill. Note the shells, birdfish and serpentine creatures in the water. The Dresden Codex also contains, (on page 76), the Flood Story, as well as the era/age/world it took place, (near the end of the 4th World), why it took place, (the creation of mankind by the Serpent), who caused the flood, (the Archaic Serpent), and who else helped save mankind from the flood waters, (the Feathered Serpent). On the top codex, it looks like they are playing stringed instruments. I am very interested in indigenous peoples. I recommend reading Ardy Sixkiller Clarke's wonderful book Skypeople. She mentions very briefly the burning of the ancient codices. It's a really interesting read because she talks to the people and meets the people who still live in the places their ancestors lived and they talk and know of their stories. They get passed down orally but it's become harder because fewer of the children learn the old language and care to carry the stories on for the next generation. In the mid 80's I owned a motorcycle agency. Some of my clients were illegals seeking work in the fields, and needed inexpensive transportation to get to work. The word got around that I would sell them used m/c's on credit. Biz was good. One day 4 young men walked in to buy 4 m/c's. I spoke Spanish, and talked to what appeared to be the leader. When they spoke among themselves, however, I didn't understand one word. I asked senor leader what language they were speaking. He said Mixtec. The leader was the only one that spoke Spanish. They never missed a payment.